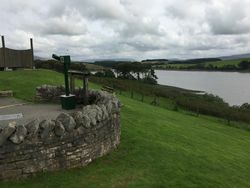 Killington Lake takes its name from Killington Reservoir, and on the right day this offers a view which forgives any misgivings inside the services. Northbound traffic should use Moto's Burton-in-Kendal. First two hours free for all vehicles, after which cars must pay £12 and HGVs, caravans and coaches £22, or £24 to include a £10 food voucher. Prices are paid using PayByPhone - more details or in the shop or restaurant. The location code is 5276. Construction work at the old services. Killington Lake's branch of McDonald's opened in March 2014, replacing space that was formerly utilised by Restbite and The Burger Company. This coincided with a refurbishment of the seating area. The filling station is operated by BP Express and was refurbished in summer 2018. The view from the back of the services. 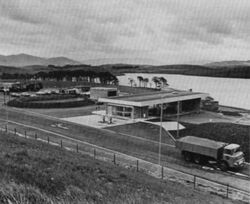 When the M6 was built through Cumbria, the Department for Transport were working on the principle that placing service stations in places with good views would get more people to stop. For this reason, services were proposed at Tebay northbound and Killington Lake southbound: two smaller services would have been more popular with the struggling operators than one large one. Despite this, the initial tender process received no bids at all. As a trial the new tender only required one brand of fuel to be sold, and allowed the services to be developed in two stages. BP were the only firm to reply, and they won the contract. At the time BP had a joint marketing venture with Shell-Mex, who were sometimes credited as the operator. The two partnered with the brand-new Roadchef to provide the catering. During planning, the services were only called 'Killington'. A separate plan to extend the reservoir here looked set to block the services proposal, but eventually the two went alongside and Killington Lake gained its distinctive facility. The service area is separated from the motorway by a man-made cutting, the land for which presumably came from the reservoir. To take advantage of the views the services offer, this became one of the first sites where the amenity building was built as far away from the motorway as possible - something which is now similar to the standard practice. The amenity building itself was originally built out of local stone, but it was far too small. It had large windows and had Alpine décor, with a café themed around a mountain hut. An open section of the restaurant was reserved for a future picnic area, which "took full advantage of the site". The opening documents were signed on 30 March 1972, after the motorway had already opened. In 1977 Egon Ronay rated the services as "poor". He said it was pleasant to sit in, but "really very small", "painfully inadequate", "cramped", and its menu suffered from "such a lack of imagination". A 1978 government review described the services as "cheap, small and scruffy". The plan was that a second phase would open in 1978. 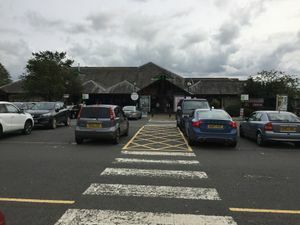 It was decided this would be built under a renegotiated tender, but plans for another southbound service area at Tebay caused the Killington expansion to be postponed. Eventually a new building opened in 1985, creating a design more in standard with Roadchef's design, but adapted to take account of the steep hill and the view to the back. In 1986, Which? magazine describe it as "the most attractive" service area, calling it "spotless" and "relaxing". The food was still criticised. The tourist information centre was converted from a workshop in 1997.